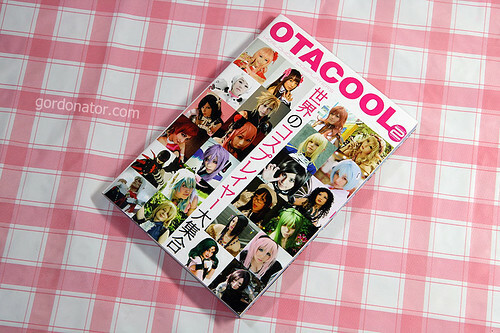 An in depth review of Otacool 2. 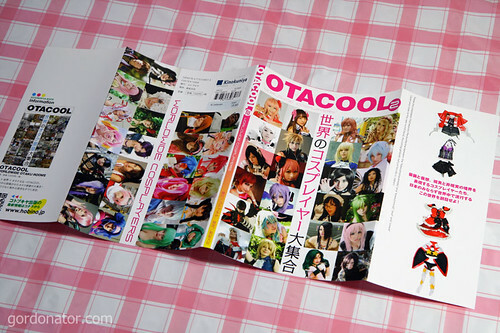 In a nutshell, Otacool 2 is a collective effort between Kotobukiya and Danny Choo which showcase quality cosplay from around the world and outer space. 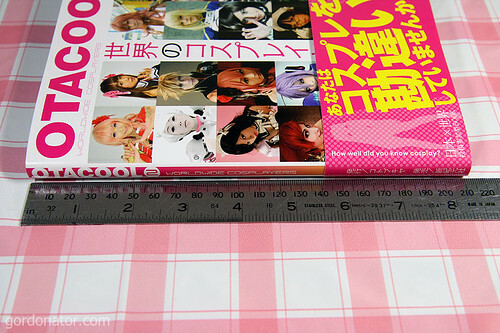 The book cover is a glossy book sleeve like most manga. 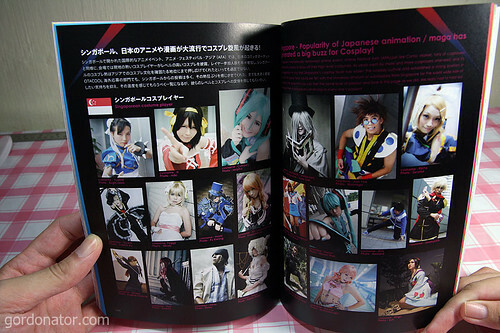 The front and back are filled with thumbnails of cosplyers. 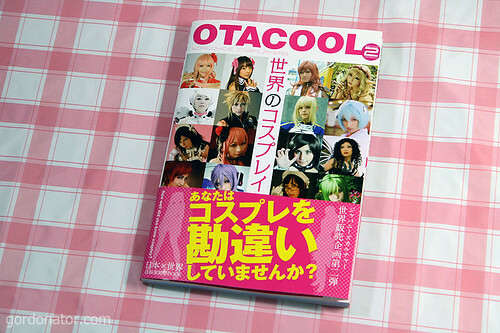 One interesting thing is that unlike most Japanese books that is read from the right to left, Otacool 2 is read from left to right, like most other books from the rest of the world and outer space. 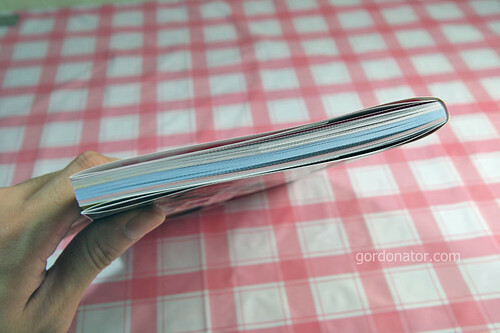 This is how the back of the book sleeve looks like. A blank. 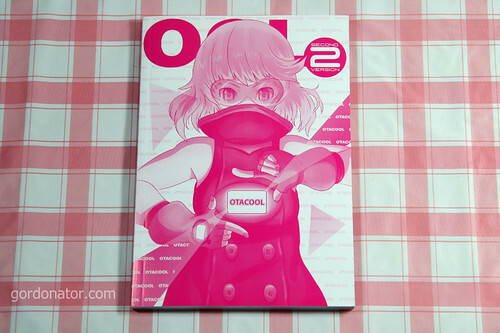 In Singapore, Otacool 2 is available at Kinokuniya for S$35.80. Some finds it to be costly but I think it’s reasonable since all pages are coloured. This is the actual cover without the sleeve. 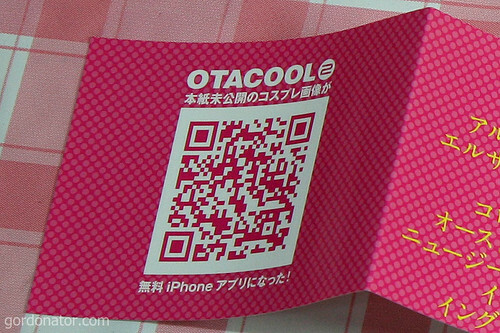 She is the official mascot of Otacool. Comes with an insert as well. This pixelate diagram is for phones installed with relevant software to take a pic, send it out and it will return with a picture of a undisclosed cosplay picture not found in the book. Singapore used to have this technology but unfortunately bad marketing and lack of interest means this project never took off. 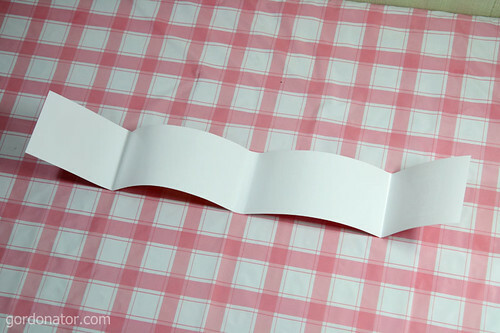 This is how the back of the insert looks like. A blank as well. This is how it looks like when the insert is applied onto the box. The back with the insert. Proceed with caution when trying this at home. 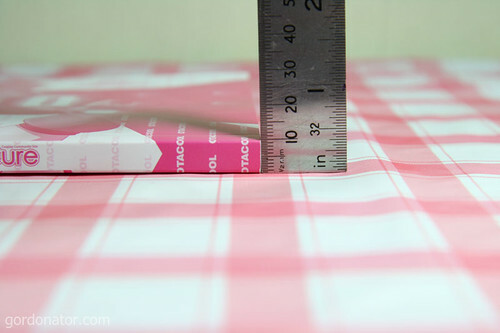 The book measures 15cm in width. 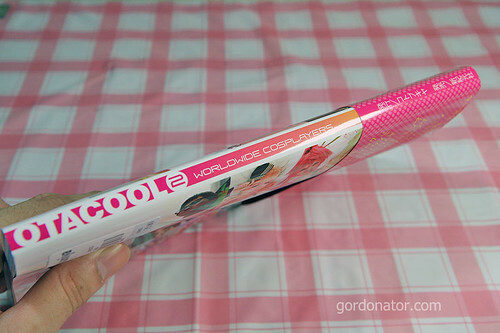 21cm in length. So total surface area is 15cm x 21cm = 315cm2. 1cm in height. Therefore the volume is 315cm3. 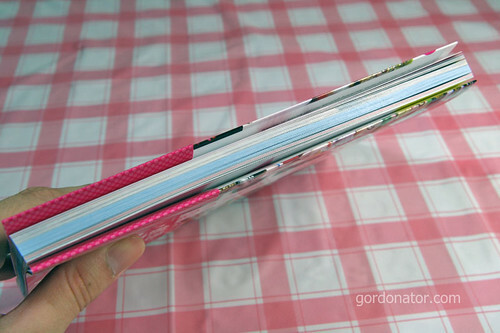 Book with sleeve and insert weighs approximately 300g. 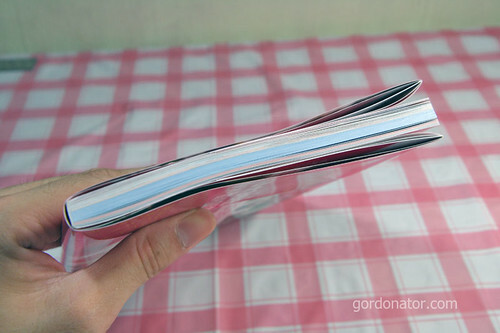 Just the book alone without sleeve and insert, it weighs 275g. This is how the sides looks like. 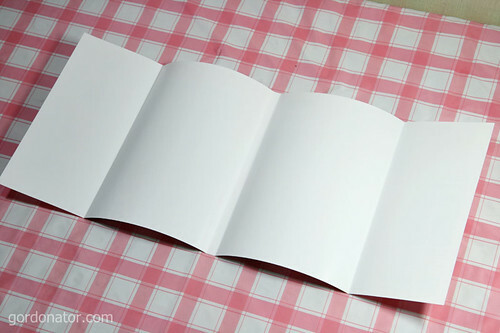 Book comes with a piece of paper. Which I think is used as a bookmark. Meido and Nekomimi are always relevant. Book is written in both Japanese and English. This is the last page. A page where the publisher, editor, translator’s name, publisher/printer’s address, copyright stuff are listed. This entry was posted in Cosplay, Otaku. Bookmark the permalink. Cool you are in the book too! 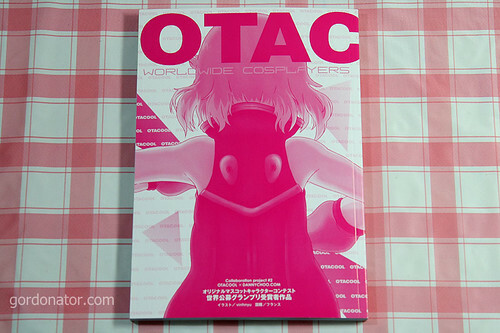 Ah,it’s here at last.Time to head to Kinokuniya.Think I’ve already told you this but congrats on making it into Otacool 2. Oh, I see you in there. Congrats! Pretty nice, I reckon. Will most likely buy it once it’s on store here. And congrats for your inclusion into Otacool 2 ( ^ _ ^). 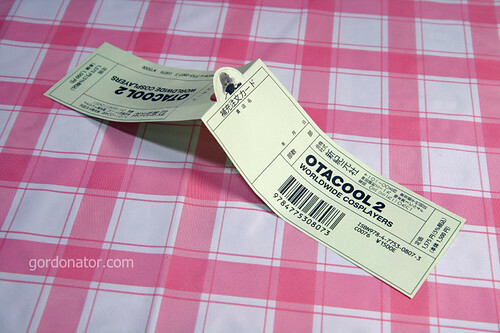 Congrats for making into Otacool2. I havnt got mine yet. omg =O I have to get this. QUICK. But the price might be high for a poor student like me. Congrats on being in the book! FYI, kino liang court is having a 20% member sale from tmmr till sat if anyone is interested. I was finding a good review of the book but what I found was something more here. LOL! Thanks for the in depth details on the book. 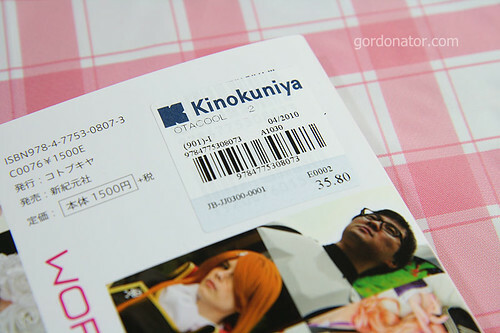 Gonna get it in KL Kinokuniya soon. ooow, didnt know this book came out so fast ! Wow this is the most technical review of a book I’ve ever read. Awesome! and I see you! got chu got chu inside! i want!